More than four million adults are enrolled in adult education programs. Thanks to the disruptive innovation of technologies and services, some industries — including online shopping, travel services, hospitality, job recruiting, taxi services, banking, music and media, and delivery services — have undergone seismic shifts to adapt to the changing times. K–12 schools and public universities, however, remain at the mercy of state legislators and are constrained by shrinking budgets. Despite record private sector investment in new edtech solutions for students, the traditional classroom model seems here to stay, with some tweaks in higher ed — but so far no radical changes. Enter the arena of adult education and, within that, the lesser known arena of adult education for remedial learners, including high school dropouts, those born outside the United States, and those unable to graduate from high school for various reasons. Currently, 4.1 million adults are enrolled in such adult education programs. About half of these adult learners are in high school equivalency and basic skills training sustained by federal funding, while nearly 1.9 million participate in community college programs for remedial and developmental programs; the remainder receive basic skills training through workforce development programs. While the number of applications for traditional colleges and universities has decreased over the past three years according to the National Student Clearinghouse, the number of adults enrolling in online schools is steadily increasing. This situation represents a massive opportunity for schools looking to attract students. Despite its “basic” image, adult education possesses the right set of circumstances to realize the promise of modern education and to illustrate the classic theory of disruptive innovation, where some are willing and able to use alternative pathways to forge more efficient and effective solutions to education. These approaches include both curricular and technology innovations. Since most adults are busy with work and family obligations, adult learners typically need flexibility in timing of coursework; they are also open to online learning as an alternative to face-to-face learning. Adult ed providers can offer nontraditional hours of operation and use blended or strictly online learning and self-paced coursework to serve their adult students. Indeed, adult education has already embraced several types of innovations that have benefited adult students as learners and set the sector as a solid example of edtech disruptor. Look at College for America as an example. This federally funded, competency-based system provides adults with an “all you can eat” education for a maximum of $2,500 per year, giving them an opportunity to earn an associate’s degree for $5,000. Likewise, Khan Academy and Goodwill Industries’ GCFLearnFree.org are two other grassroots options designed to provide adults with free or inexpensive means to complete their educational goals. Moreover, there is extensive smartphone penetration in the adult education market, whereas K–12 schools actively ban mobile. Tyton Partners estimates that of the 4.1 million adult education students in programs today, 55–75 percent own smartphones. The use of smartphones or other small devices for adult education could potentially offer a cheaper alternative to computers while using the same or similar programs. Finally, a majority of these learners are earning their high school diplomas online, which positions them to matriculate into online postsecondary education. These learners use technology as a means to learn, and they seek flexible class schedules. All college and career schools offering digital education should seize the opportunity to serve this growing segment of learners. Another disruptor, online prep courses give adult learners a leg up to successfully complete their high school diploma and ready themselves for college courses. Adult education is inherently tied to career pathways, as many of the students already have experience as working adults and want a direct bridge to their next career move. By offering tailored content and career pathways programs, adult education providers can work in tandem with employers. One illustration of this kind of dynamic is demand-driven workforce development: Educators can screen students and work directly with employers to place candidates in jobs while supplying students with the training directly relevant to fields they are interested in pursuing. Employers also help fund innovation in adult education through corporate training programs and upskilling. The adult education sector need not completely reinvent the wheel to bring technology to teaching and learning. Coding boot camps, MOOCs, microcredentials, badges, language learning apps, and GED training resources already offer entire alternative education methods and credentialing. 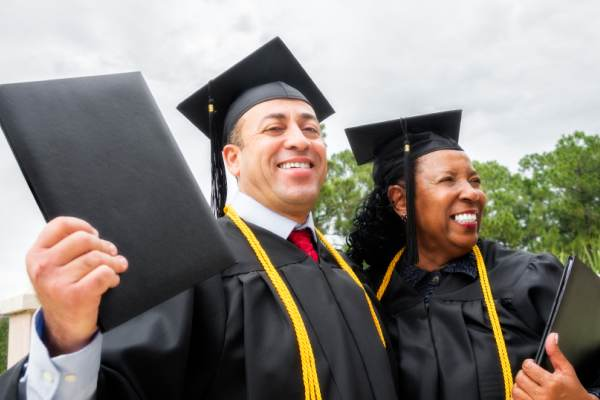 These supplement the many institutions using technology to educate adult students, such as Western Governors University, Southern New Hampshire University, Arizona State University, Penn Foster, and the many traditional campuses offering online courses and programs. The adult education sector is uniquely positioned to lead the charge in the alternative education space, while continuing to leverage innovation as a means of maximizing students’ education experience. In partnership with creative entrepreneurs, edtech platform providers, employers, policymakers, and foundations, adult education professionals have the opportunity to lay the foundation for next-generation education and lead the way in the next disruption of an entire business sector by encouraging radical innovations in edtech. Adam Newman, “Learning For Life: The Opportunity for Technology to Transform Adult Education,” Tyton Partners, October 9, 2015.